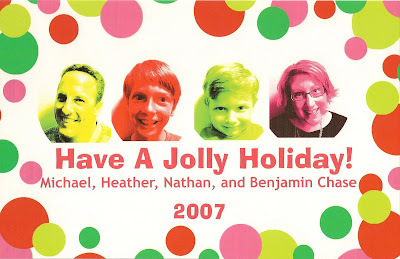 Strangely enough, after the "perfect" card of 2006, we got a number of complaints! How is that possible, you ask? The overwhelming consensus was that it was BORING! Can you believe it? So for 2007, we decided to go crazy. Crazy, I tell you! It wasn't too hard, we are already crazy so this was just capturing us at our natural best! I just played around and designed and created it myself. Again we got a huge response. Not complaints this time. But just about everyone said, "your card scared me just a little, but it's so YOU". So there you go! For privacy's sake, I marked out our address on the back since we still live at that location! 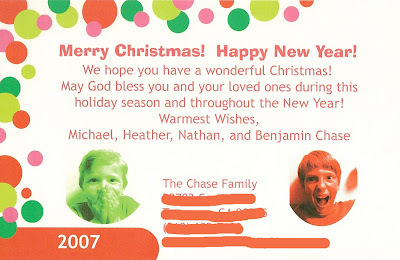 If you want our address because you need to send us your Christmas card, let me know and I'll send it to you! loved looking at all your Christmas cards... I can't remember the last time I even took a picture... let alone one of the whole family!